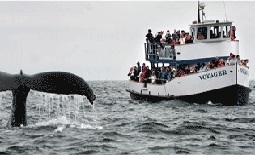 The Voyager Redondo Beach offers boat rides off the coast of Redondo Beach as well as Whale Watching trips. This 65 ft. boat holds up to 125 passengers and tracks the Gray Whale as they migrate from Alaska to Mexico or on their way back. The Voyager offers spectacular views as well as a chance to see a variety of whales, dolphins, sea lions and marine boards.